Most of you have probably hear the sad news: Florian Kirch passed away last week. I can’t claim to have known him well; a little better after preparing for and competing at the WPC this year with him. That was a great experience, I’m glad I had the opportunity. The whole thing is quite a shock, more so since he seemed full of plans: He’s behind the first German youth sudoku championship that is being held this year, and was actively working towards a WPC hosted in Germany, besides a variety of activities in other fields. If you’d like to solve some of the puzzles he constructed, I’ve collected what I was able to find. I’d be happy to extend the list. The 2015 Logic Masters certainly stands out, my favourite of his rounds there being “Vorsicht klebrig”, a set of Tapa, Fillomino and Slitherlink puzzles that had to be matched to normal, cylindrical and Klein bottle topologies. I’ll close by reposting a puzzle dedicated to Florian’s memory that I first published here on the portal. Rules Glue the grid to form a Klein bottle, by identifying one pair of opposing edges directly, the other pair after flipping. Then solve as an ordinary Tapa. This entry was posted in Puzzles and tagged hard, tapa, toroidal, variant on 2015-12-21 by rob. Here’s a Mochikoro puzzle. The type features on next weekend’s WCPN contest. Rules Shade some empty cells, such that the unshaded cells form rectangles. Each clue is contained within an unshaded rectangle of the given area, and each rectangle contains at most one clue. 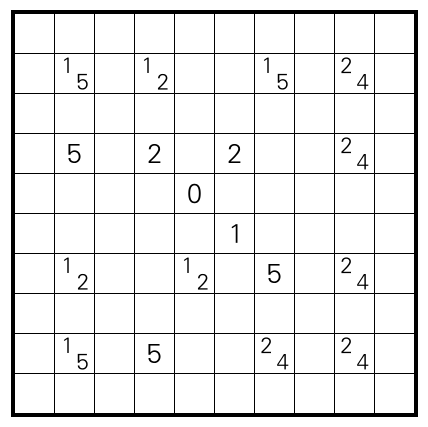 Furthermore, all unshaded cells must be connected by corner, and shaded cells can’t form 2-by-2 squares. This entry was posted in Puzzles and tagged mochikoro on 2015-12-15 by rob.